B & H Dairy Kosher Restaurant | I dream of having one hollow leg. Unlike past years and in the interest of saving money, this summer I wasn’t planning on doing any upscale lunches on my Summer Friday afternoons. But then favourable reviews for The Clocktower started coming out in July, and I decided I would treat myself before the seriousness of September began. Critics and bloggers seemed to be into the lunch-only fish and chips, and as some friends and I have a bit of an in joke about ordering this dish, I thought it would be a fun choice. Two days before my reservation, Pete Wells of the New York Times filed his two-star review and for a moment, I wore a smug smile. But then it quickly wore off. I didn’t really want to go. I didn’t want to go to a hotel restaurant. I didn’t want “celebratory elegance.” I just wasn’t in the mood to spend a lot on lunch and have my tush kissed. When I think about the meals I’ve spent a large chunk of cash on or saved up for, I think about returning to places like Semilla, Luksus, The Catbird Seat, Blanca, and Momofuku Ko, rather than Per Se, Eleven Madison Park, Del Posto, or Le Bernardin. Smaller, less formal places, whose food and atmosphere I feel more at ease with, more excited about. I was pre-judging The Clocktower, yes, but even if I left it at wanting to save money, I was justified. 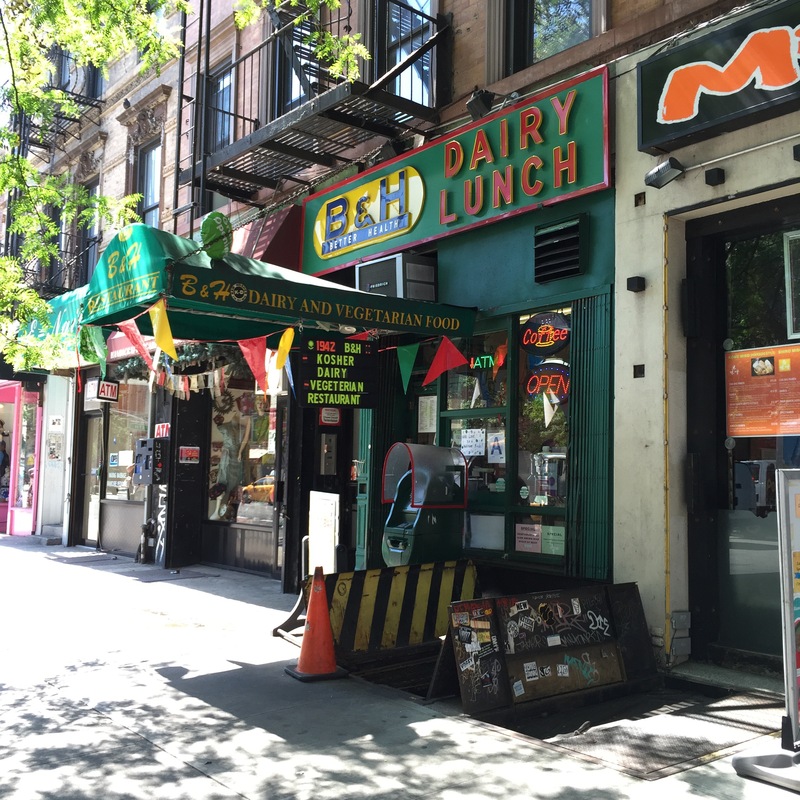 So, when I left work on Friday, I headed to the East Village for a $9 (tip included) lunch at a New York institution and one of the only remaining dairy kosher diners in the city: B & H Dairy Kosher Restaurant. It was always a place I had wanted to try for its history, but like so many places on such lists I have, I had yet to make a visit. “Yet” might have been “never” when disaster struck with a devastating explosion in the spring. My need for the opposite of fine dining and its reopening coincided perfectly. B & H is well-known for its house challah bread, which can pretty much work its way into almost anything that you order. For the amount they must go through, I’m not surprised that it’s not overly eggy or rich. It’s got that good challah crust, though. 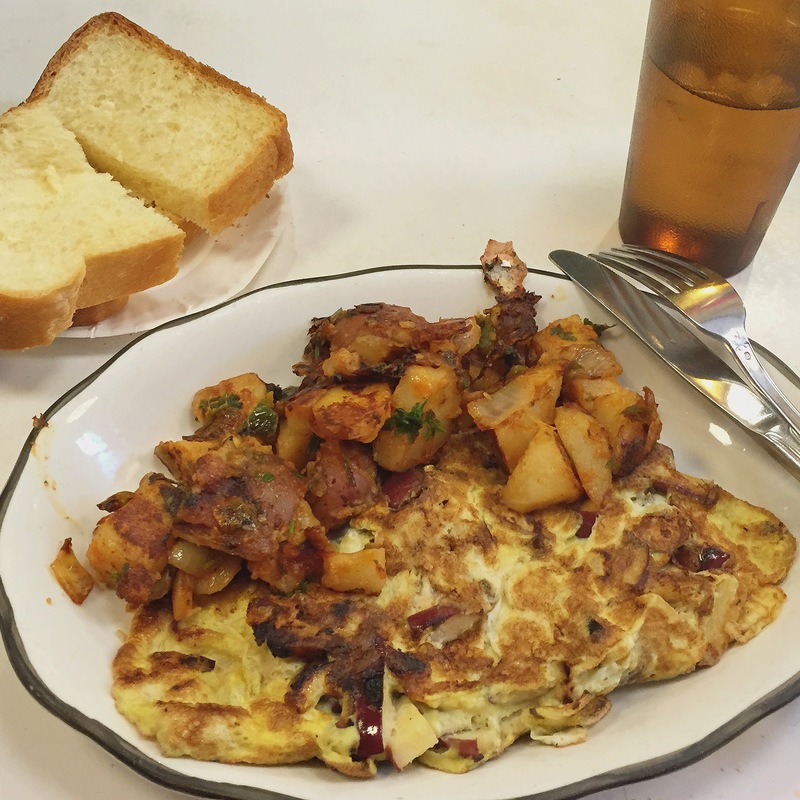 Soups, blintzes, perogies, and tuna melts all get lots of fanfare, but I decided to try the apple and cheddar omelette, knowing I’d get bread and homefries. I usually prefer my omelettes unblemished and barely set, but I didn’t mind this well-cooked one. Chopped apple is fried on the griddle before the eggs get added. This softens the apple, but it also allows for some of the natural sugar to be released. The omelette definitely has a sweetness to it, and I’m thinking that the browning is not so much overcooked egg as it is a degree of caramelization from the sugar. You can’t see it in the picture, but within lies a band of melted orange cheddar cheese. I hacked off swaths of the omelette and placed it on the soft, buttered challah. More salt was needed across the plate, but that’s what a shaker is for. I don’t quibble over having to add seasoning when food is this affordable. Ketchup for the homefries and all was right with my afternoon. But obviously, a visit to B & H is about much more than the food. It’s about watching in awe the perfect orchestration of ordering, cooking, serving, and eating that occurs in a mere sliver of a diner. And if you’re a two-top and decide to sit at a table, table service means standing up to the counter and taking your plate when called – there’s no room for the host/server/cook to come out and present anything to you. It’s about watching a small Latino man coordinate (and cook most) orders and the tasks of the two other kitchen staff while simultaneously being warm to customers and clearing plates. It’s about sitting on an old stool between an NYU student and a crotchety relic from the neighbourhood. It’s about New York brusqueness. It’s about an experience of this city that you will never get at a place like The Clocktower. It’s about being thankful that such experiences still exist. This entry was posted in Eating Out: NYC on August 31, 2015 by historicalartfox.